Recently I came across a very used, older model SB-1000CB in Japan. The bass had a lot of wear and also a major problem: a warped neck and a maxed out truss rod, making it virtually unplayable. I decided it was a good candidate for a Cliff Burton tribute bass. 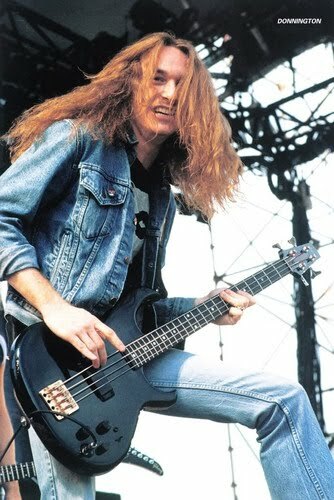 As you probably know, the 'CB' in the name of the bass stands for Cliff Burton, but the specs of the bass aren't exactly what Cliff actually used. The re-issue SB-1000CB comes with oval inlays, black Gotoh hardware, and of course the active BB Circuit/6 position tone selector. Cliff did use an SB-1000 for a short time (see photo), but it didn't have black hardware or oval inlays. His Black 'n' Gold model did have oval inlays, though. So it seems Aria decided to combine the two models and add some modern touches such as the black Gotoh hardware. I actually like the look of the new re-issue models, but I wanted to try and make the bass look more like what Cliff used. I pulled out some old Aria Pro tuners, an original SB bridge, and some original SB knobs for the tribute bass. I know the string spacing on the original SB-1000s is different (narrower), but I didn't have one of those bridges and also I wasn't sure it would be a good fit for this neck profile. The bass was repaired and modified by mdcustomshop.com in Seoul, Korea. The repair included removing the frets, 'dressing' the fingerboard (sanding it down to make it straight), re-setting the truss rod and finally re-fretting the bass. In addition, I had him make a new rosewood truss rod cover since the original was lost. He also had to do some routing to accommodate the original SB bridge. The bass was pretty scratched up when I got it, but he restored a lot of shine to the bass! It's currently setup with RotoSound Swing Bass 45-65-80-105 steel strings. I'm very happy with how the bass turned out - it plays and sounds wonderfully now! You can see more pictures of the bass here. 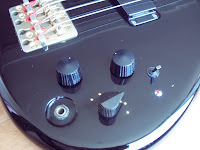 There are some pictures of the bass before it was modified/repaired, too. A few more notes about the bass: First, it is very heavy! I don't have a scale, but will weigh it when I get access to one. The neck profile is much different than the original SB-1000s. This re-issue is thinner at the nut and gets wider towards the bridge, more like a standard bass. 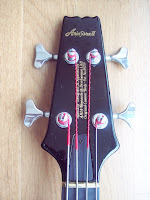 The original models were a little wider at the nut but did not widen as much towards the bridge, making for a very playable bass in the higher registers. 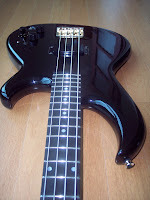 I find the neck profile of this bass to be more similar to the SB-Elite models. The serial number of this bass starts with a 95, so I'm not sure if it means it was made in 1999 or 1995, but it was certainly not made in 2009. The contours of the bass (body and headstock) are slightly more rounded than original SB basses. The Aria Pro II logo is a little bit smaller than the original SBs, too. There are a few other minor differences but overall the bass keeps the look and sound of the originals very well. Aria Pro + Alembic = Awesome!